Maintaining correct and reliable medical documentation is of paramount importance for your healthcare organization. The need for documenting all the medical procedures for future reference has made the medical transcription an essential part of the healthcare industry. It is important that your medical transcriptionists understand the medical terminologies and jargon used by the doctors to avoid any errors. In medical transcription, the quality should always be your topmost priority. A small mistake in the transcription process can lead to huge losses. There may be many ways in which errors creep into the transcribed documents. But, the good news is you can take several courses to ensure that it doesn't happen. If you want to know the most common reasons for medical transcription errors, we have listed here some of the ways to eliminate medical transcription errors. Some Reasons Why Transcription Errors Occur? An alarming statistic relating to medical transcription is that about 30% of the medical transcriptions are inaccurate. This result in an annual revenue loss of about $17 billion to $29 billion. Every time your transcriptionist transfers information to the digital file, there is a risk of error. Even a minor mistake can aggravate and cause huge losses. 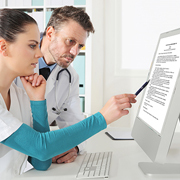 This is one of the most important and obvious ways of reducing medical transcription errors. If you outsource the medical transcription services, make sure that your offshore team is well trained and have robust language skills. This will help keep your medical record management error-free. Once the medical transcription is done, it must be sent for proofreading. It is important to have an expert team of proofreaders and editors who can thoroughly examine the transcribed document and sieve out the errors. More the number of quality checks, lesser are the chances of errors in the document. Medical care is directly related to the information available to the doctors. Thus, the quality of the transcription equipment in your healthcare organization is as important as the quality of your physicians. Constantly upgrading the reporting system and implementing safeguards to improve the quality of your current transcription equipment, ensures better sound quality. Having a generic template helps the team to make fewer errors. Encourage your clinicians to set a template which will ensure that all the required information about the medical condition is mentioned. This will also make it easier for the transcriptionists to transfer the files. It is important to consider and track all the feedback from clients, transcriptionists, and editors. This will help in identifying the most common type of errors, how often they happen, and by whom. If necessary, additional training must be provided to reduce such errors. Assign every client with a specific group of transcriptionists and editors. As they will be working with the same client, they will know exactly what type of errors will be common in the documents and can correct those. Also, the transcriptionists are experts in that field and will be able to understand the terminologies. There are plenty of good quality speech recognition applications in the market today which can be used to transcribe the audio files. This will speed up the transcription process as compared to the manual process. Combining this with a quality check level will help in improving the quality of your medical transcriptions. This step may seem to be an unnecessary and a waste of time but is actually beneficial. Having a clear picture of the nature of the transcription will be helpful while writing. This tip will improve the efficiency of the transcriptionists and speed up the transcription process. Speed is important when it comes to transcribing medical files, but the accuracy of the transcription must be given the highest priority. Errors and typos which happen when you type too fast will slow the process down in the long run. This is one tip, which you should certainly focus on and strive towards mastering it. Your team of transcriptionists must practice their typing skills. Generally, people use 2-3 fingers when they type, while we have 10 fingers at our disposal. Focusing on this particular aspect will considerably help improve the quality of your medical transcriptions. There are many online typing tutorials which can be leveraged to practice and improve the speed and quality. Outsource2india has been a leading provider of high-quality medical transcription services in India and a plethora of other healthcare services. We have been in the healthcare services domain for almost two decades now and understand the exact pain points of the customer and provide the services accordingly. Our team comprises some of the most skilled and talented medical transcriptionists who understand the importance of speed, quality, and cost-effectiveness of medical transcription services. Having our delivery centers across time zones, we have the capability to provide quick services to clients across any time zone. All our services and processes are ISO certified and comply with the HIPAA standards. If you are looking for a reliable, cost-effective, highly accurate, and efficient medical transcription service provider, then you have come to the right place. Get in touch with us today!